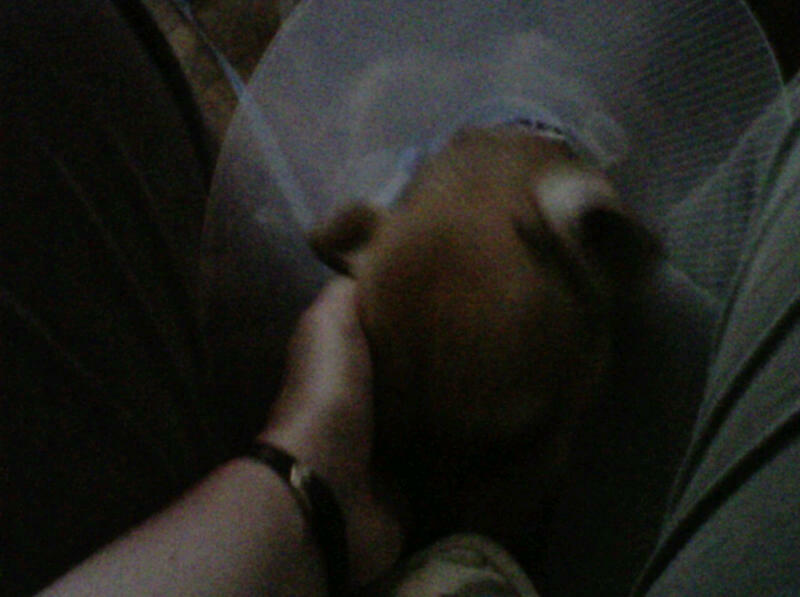 This is a terrible picture of the cone-of-shame dog. You can't get a decent picture of him because he's in constant, crazy motion. I wish I had a video camera. I wish I'd had it last week, too. If I did I would make two videos. Video 1: The dog on approximately 2.5 hours of play and exercise per day. Not unbelievably strenuous, all outside exercise on leash, but focused on him for those hours. Result: High strung, directed, quirky, happy companion animal. Kind of like your cousin who's super smart and nice but did re-enact Close Encounters of the Third Kind at Christmas dinner the year he was thirteen. Video 2: The dog after 2 days of 4-5 10-20 minute walks per day, all on the short leash. No playing with other dogs, no stairs, no fetching. Result: Chupacabra. Like the guy who sat behind you in Chemistry in High School and tried to cut your hair. With a blow torch. Related pro-tip: When the chupacabra whirls into and out of your lap at the speed of panic that cone can nick your jugular. Apply pressure to the wound immediately. I warned you about neutering your dog. Oh wait, that wasn't me. Never mind. You will love him so much more when he's had a proper walk. Just make sure he doesn't visit El Paso this month or you may have trouble. May I recommend a cheap point and shoot camera my friend? Nearly all of them have great video options nowadays.